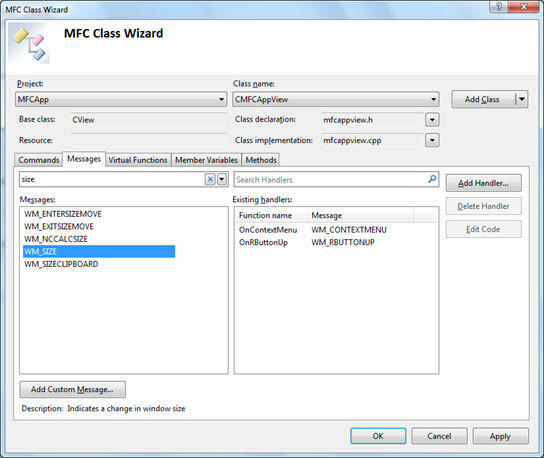 MFC Class Wizard. We implemented a well-known for Visual C++ 6.0 developers Class Wizard tool. This addition provides developers with an easy way to maintain a class context inside one box: you can assign a command handler to the object ID, add a message handler, override a virtual function and add class members and methods. Each list control such as commands or message list comes with a corresponding filter box, so you can quickly locate a required name among hundreds names. Hit Ctrl+Shift+X and see how easy is to maintain your MFC application now! MFC Ribbon Designer. Visual Studio 2010 introduces an easy way to edit the Ribbon control: this designer dramatically simplifies the ribbon creation process and allows creating the "state of the art" products in few minutes! You don't need to write hundreds lines of code anymore: just open the Ribbon Designer in the Resource View and enjoy using it. 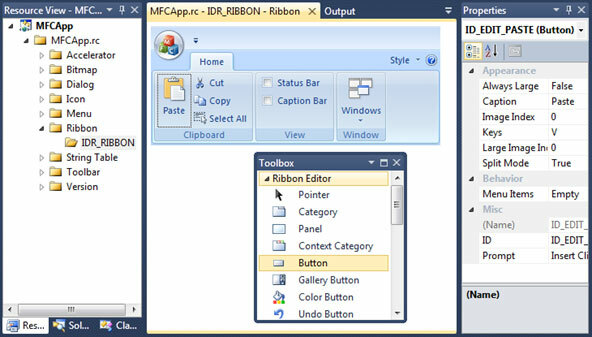 You can drag the Ribbon elements like buttons or galleries from the Visual Studio toolbox and drop them to the ribbon editor, assign high-color images to the ribbon buttons, preview your ribbon in various visual themes such as Office 2007 or Windows 7 and add MFC command handlers directly from the designer. The properties of the selected element can be edited in the Visual Studio "Properties" pane. Auto-Complete for #Include statement. This feature enhances Visual C++ editor IntelliSense. Now, when you begin typing a file name after '#include' statement, a popup list with matching file/folder names appears. The tooltip on the right of file name shows the full file path. New MFC controls in the Dialog Editor. 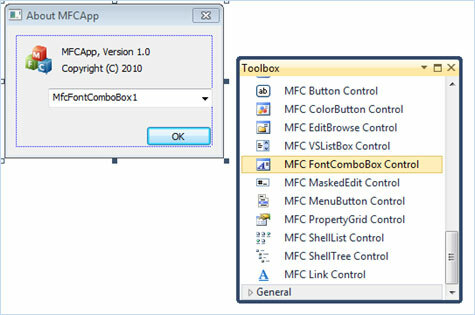 The rich set of the new MFC controls introduced in Visual Studio 2008 Feature Pack appears now inside Visual Studio Toolbox. You can drag the new control from the toolbox to the dialog and modify its properties in the "Properties" pane. Dialog Editor Mockup Background Image. 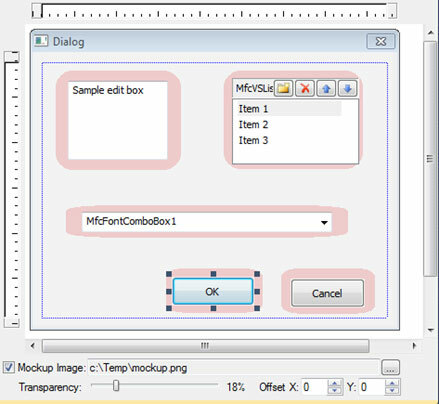 Sometimes you need to create the dialog layout from mockup images prepared by a graphic artist or application GUI designer. In Visual Studio 2010 Dialog Editor you can load an external image and put in on the dialog working area. Now just drag the dialog controls and move them to the required location according to the predefined layout. The new "Mockup Image" dialog bar located at the bottom of the Dialog Editor allows specifying image path, transparency and offsetting. Windows 7 Taskbar Interaction. 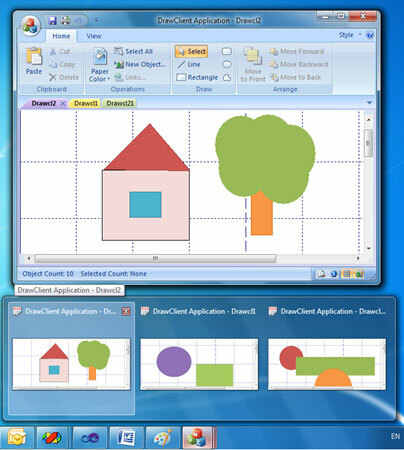 An MDI application now automatically takes advantage of interaction with Windows 7 taskbar. You don't need to write any additional code to have a view content displayed on taskbar thumbnails, or pick a view by hovering over thumbnails and clicking them. 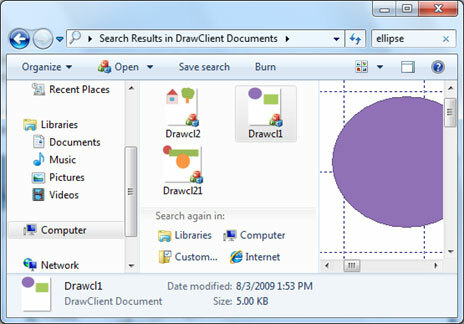 Document icon displays the latest saved content. You can preview the document in Explorer "Preview" and "Details" panes. High DPI support. MFC is High DPI-compatible now: you can run your application in High DPI modes without any visual artifacts. All toolbar/menu/ribbon images will be scaled automatically using a smooth resizing algorithm. In addition, you can load a special image set prepared for the specific screen resolution. Windows Touch support. CWnd class has a new set of Touch/Gesture message wrappers and you can add Windows Touch support to your application in few lines of code. Transactional File System support. A new CAtlTransactionManager class provides a wrapper to Kernel Transaction Manager (KTM) functions. You can either use this class as standalone object or along with existing MFC file management classes such as CFile. Common File Dialog update. Implemented new Windows Vista/7 features such as custom fields, properties and favorite places in CFileDialog class.